A unique combination of savory chicken flavor and rich cream makes this Campbell's cream of chicken soup irresistible! Sold in more than 100 countries and promising a time-honored nostalgic taste, there's nothing quite like Campbell's for high quality soups in classic flavors. Great for cooking, this condensed cream of chicken soup can be prepared in a variety of ways while offering a familiar flavor that's a worthy addition to the menu of your school, health care facility, restaurant, hotel, or diner. For fresh meal ideas, mix Campbell's cream of chicken with chicken and pasta noodles or rice. Add to hearty chicken soups or chowders, or use to create delicious gravy, casseroles, pot pies, and more. Its homemade taste and easy preparation provides quality service that will keep your patrons coming back for more. To prepare, simply combine one can of soup with one can of water in a 4-qt. pot. Simmer over low heat and enjoy! Campbell's Condensed Cream of Chicken Soup is so rich and creamy. It's great for use in casseroles. Your guests will take notice of the quality of Campbell's. The Campbell's condensed cream of chicken soup makes a great base for our pot pie stew. The soup is amazingly priced and so easy to prepare. Just add water and its great. 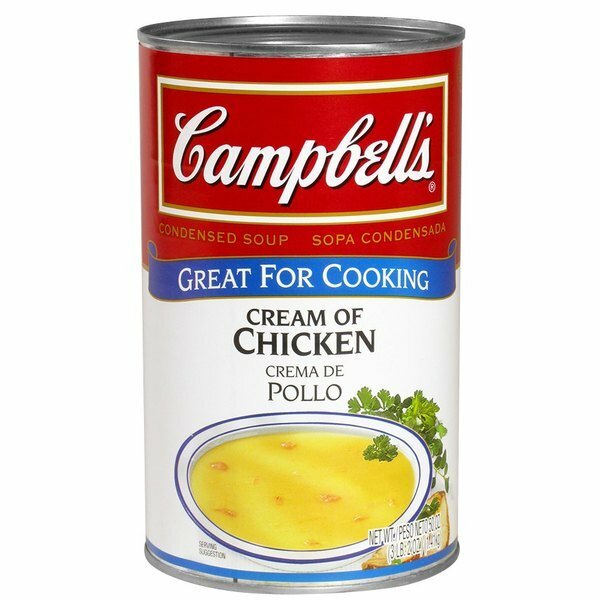 The Campbell's condensed cream of chicken soup that is great for making our casseroles and using as a base soup. The soup has a great price. We are particular about the soups we use - highly recommend Campbell’s cream of chicken soup because of its high quality. Fresh and tastes great! The cream of chicken soup by Campbell's is excellent. I love the great quality and the taste is great. A perfect addition to our pot pie casserole. A great tasting and great consistency cream of chicken soup from Campbell's. The soup is great for making classic casseroles, and it is great to use as a base for chicken and dumplings. I am in love with the warm chicken-y flavor of this soup. 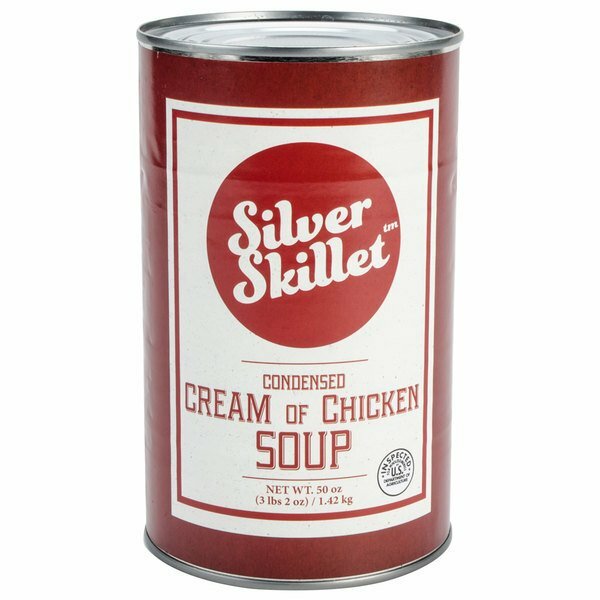 My mother in law makes a great chicken and dumpling recipe that uses a can of this and it's wonderful. Campbell's Cream of Chicken Soup is the Best for cooking perfect taste I have had others and no other compares all others are TOO salty but not this one it is Great! Cream of Chicken goes fast in our house. This 50oz. can is more then enough to make two huge dinner casseroles. Its thick and creamy goodness that is second to none. Nothing is better than Campbell's Cream of Chicken Soup! I use this for my chicken and rice casserole! It makes it so most and has plenty of flavor! The Campble's Cream of Chicken Soup sold in 50 oz. Can. It is great served alone or, or put in your favorite casserol. The customers love it. We at Butterfly Cafe often use Campbell's Cream of Chicken Soup with other ingredients to make a delicious sturdy soup for our hungry clients. It is always a staple on our shelves. We use Campbell's Cream of Chicken soup to slow cook deer and elk meat in and then make a large bowl of soup with enough milk to make the soup pourable and we make white rice and we pour the soup over the rice and the deer or elk meat. This is a big favorite treat that has been passed down now for a few generations. Instead of buying several cans of Cream of Chicken Soup, now we just need one. I sure hope it comes with a 5 point Label for Education!! For someone that likes chicken soups, the cream of chicken is a step-up from the regular chicken noodle soup. This soup is creamy and it has the smooth chicken flavor. It is also convenient to dip-in the crackers or nachos inside the cream of chicken soup. Save $1.40 with our Recommended Product! Try this Silver Skillet cream of chicken soup instead! Quick and easy to prepare, this soup offers affordability, convenience, and homemade flavor. It features the classic, savory taste that your customers crave at a great value!